One of my greatest pleasures only a few years ago was to finish my workday at 3:30 and retrieve my granddaughter from daycare. We routinely sang nursery rhymes all the way to Grammie’s house. At three, her language skills were developing rapidly, so I employed a type of ‘response’ singing; I would sing a few words and she followed with whatever words came next. One day I opened with, “Humpty Dumpty sat on the wall. Humpty Dumpty had a great ___ .” Not missing a beat, she gleefully sang out “DAY! !” In that one word, she completely changed Humpty Dumpty’s fate. 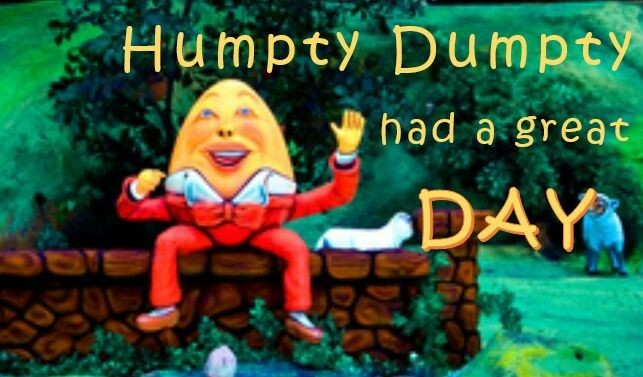 It caught me by surprise; but after thinking about it a moment, is it really necessary that Humpty always have “a great fall?” “A great day” is more positive, and presumably what Humpty Dumpty would prefer. It is no wonder children grow into adulthood with negative ideas. Nursery rhymes are often violent, with sad endings. Why not let Humpty Dumpty have a great day, indeed! Continuing our little sing-along, I started to re-script nursery rhymes, giving them a more positive focus. Most traditional nursery rhymes originated as medieval political commentary. They were a sly way to snipe at oppressive monarchies who repressed freedom of speech and upward mobility. And over the centuries little thought has been given to how the tone of the rhymes might influence children’s way of thinking. In the modern age, there is no rhyme or reason to program children with negative ideas. Young children in particular are naturally enthusiastic and hopeful. Adults should support children’s positive thoughts and acts that emerge into a pleasing life. It is amazing how much negativity controls many people’s lives. We live in a society with virtually limitless possibilities. Yet Humpty Dumpty cannot be put back together. Jack falls and breaks his crown after ascending the hill. Miss Muffet is frightened from her tuffet by a spider while minding her own business. Mary’s poor lamb isn’t allowed in school. And the list goes on. Not surprisingly, a daily dose of such fret and worry could lead a child to conclude that such is one’s lot in life. As an adult they then surround themselves with people like themselves. After all, misery loves company, right? Such that, whether it’s a group of friends or group therapy, interacting with others who have similar problems is assumed to somehow present solutions. A group of therapists and one client might be more helpful. The alternative is to acknowledge that negativity in any form, whether nursery rhymes or collective grousing, perpetuates negativity. While a selection of predominantly positive friends, acquaintances and media counteracts it. Programming the mind to de-emphasize negativity is really that simple. But it is not necessarily easy. As a parent or caregiver, it is important to recognize subtle negativity. That may mean rewriting old nursery rhymes so Humpty Dumpty has a great day; Jack and Jill run down the hill with a puppy; Ms. Muffet befriends the spider. Or select more neutral songs such as BINGO or The Wheels on the Bus. Setting a child’s mind to a positive attitude helps them believe in good and act kindly toward themselves and others. And over time that becomes a habit of mind. Adults programmed to negativity in childhood can reframe such attitudes. That is a major function of hypnotherapy. It is painless, requires no medication, and is surprisingly relaxing.